The Margherita Journalists’ Association organized a convention at Margherita against the 2015 framework agreement between the NSCN (I-M) and the Centre. Speakers at the convention strongly opposed handing over of Assam’s land to Nagaland as a part of the Naga pact. The speakers expressed grave concern over some recent maps of Nagaland which, they alleged, have included more than 66,000 hectares of land comprising Tinsukia, Dibrugarh, Sivasagar, Charaideo, Jorhat, Golaghat, Karbi Anglong, West Karbi Anglong, Nagaon and Dima Hasao districts of Assam. They also demanded that the Centre make public the clauses of the agreement. The convention presided over by journalist Ram Prashad Ambedkar decided to launch a joint movement with the support of various organizations including KMSS, AJYCP, AASAA and AABP. The organisations demanded early release of documents of all correspondence related to the pact. 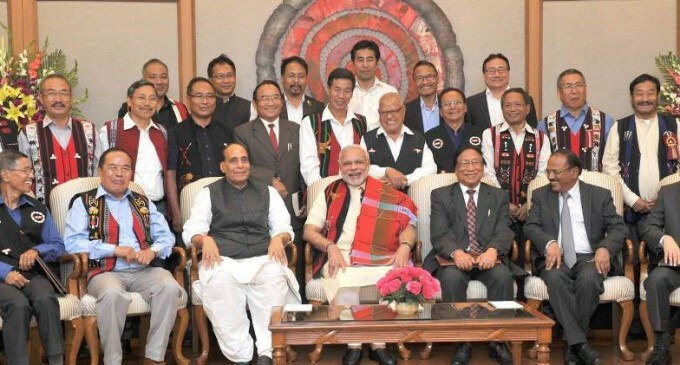 Earlier, the NSCN (I-M) top brass had claimed that the pact ‘recognises’ their demand for integration of all Naga-inhabited areas in the region. Altogether 1.3 lakh square km of land in Assam, Manipur and Arunachal Pradesh will become parts of ‘Greater Nagaland’ if their demand is accepted. Kanchan Bora, joint secretary of AJYCP, Tinsukia district committee, Aboni Chaliha, president of AJYP, Tinsukia district committee, Pappu Dutta, general secretary of Chatra Mukti Sangram Samity, Tinsukia district committee, Ramanus Lakra, general secretary of AASAA, Tinsukia district committee and trade union leader Ranjan Choudhury spoke at the convention. They demanded release of documents of all correspondence related to the pact.